In a shock decision the US Supreme Court has ruled that the firms behind file-sharing networks must answer for what people do on these systems. Here we take a look at the decision and the implications it has for the future. The US Supreme Court has said that Streamcast Networks - which created the software behind Grokster and Morpheus file-sharing systems - can be held responsible for the rampant piracy on those networks. Streamcast had argued that it could not be held responsible for the uses its software was put to, but the Supreme Court justices did not agree. They said there was "substantial evidence" that Streamcast had profited by promoting copyright infringement or piracy. The Supreme Court has not outlawed legitimate file-sharing. It has simply called Streamcast to account for encouraging the infringement of copyright. The case will now be sent back to a lower court where the media firms that filed the original complaint are expected to press for substantial damages. Why is this ruling a surprise? All the lower courts sided with Streamcast and said that it did not have to answer for this piracy and backed up its case with legal precedents, so some were surprised by the decision. The main historical court case Streamcast drew on was the Supreme Court ruling in 1984 on Sony versus Universal Studios. In that judgement the Supreme Court judges said that the Betamax video recorder should not be outlawed because there were more legitimate uses, and users, of it than illegitimate ones. Also many other courts have declined to make hi-tech firms, such as net providers, answer for what users do with their technology. And that is what the Supreme Court justices have upheld in this decision. File-sharing technology has not been censured - in fact the justices noted the many legitimate uses of the technology - but the promotion of it for piracy has been. 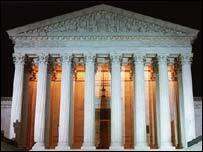 Interestingly, the decision in the Streamcast case was reportedly unanimous, even though some of the justices sitting now were also on the Supreme Court bench when the ruling on Sony's Betamax video recorder was made. The ruling is also a surprise because the US technology sector generates far more money than the music and movie industries and many pundits expected this to carry weight with the Supreme Court. Why is this ruling significant? The ruling is important because of the big changes taking place in the way that people get hold of and consume music, movies and TV programmes. There is no doubt that Napster and the other file-sharing systems that followed it have revealed a huge pent-up demand for digital media. Arguably the iPod and iTunes would never have been as successful without Napster and its ilk. Although the music and movie industries are fighting the networks to stop piracy, it is widely believed that some kind of file-sharing system will eventually be the best way for fans to get hold of the content they want to consume. It is likely though that a locked-down network that limits sharing, such as iTunes and all its rivals, will be the music and movie industries' preferred route for this downloading. This ruling is likely to give content owners more power to demand that secure locks be put on the digital media being offered. Can I still use my iPod/MP3 player/portable video viewer? You can. The ruling only concerns Streamcast and its encouragement of copyright infringement not specific technologies. However, the ruling is likely to encourage content owners, ie record labels and film studios, to pursue persistent pirates. They may also go after firms that do not do enough to encourage what they see as "responsible" use of their technologies. There are also fears that the ruling will stifle future innovation. If the ruling is applied in its strictest sense it could mean that any maker of a gadget or device must try to predict the ways that users could abuse its creation to get round copyright laws. They must also put in place controls that stop these infringements. This could mean far more restrictions on what you can do with the music and movies you buy.